Two figures having the same shape but not necessarily the same size are called similar figures. (ii) their corresponding sides are in proportion (or are in the same ratio). If a line is drawn parallel to one side of a triangle intersecting the other two sides, then it divides the two sides in the same ratio. Corresponding sides are in proportion (or are in the same ratio). However, on the basis of last two SSS and AAA criterion you can now say that in case of similarity of the two triangles, it is not necessary to check both the conditions as one condition implies the other. The ratio of the areas of two similar triangles is equal to the ratio of the squares of their corresponding altitudes. 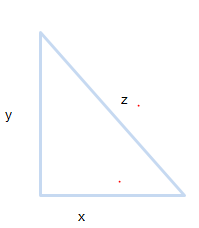 The ratio of the areas of two similar triangles is equal to the sum of the squares of their corresponding angle bisectors. 1) Let $\Delta ABC ~\sim \Delta DEF$ and their areas be, respectively, 64 cm2 and 121 cm2. If EF = 15.4 cm, find BC. Take a card board of size say 20 cm x 20 cm. Cut any right angled triangle and paste it on the cardboard. Suppose that its sides are a, b and c.
Cut a square of side a cm and place it along the side of length a cm of the right angled triangle. 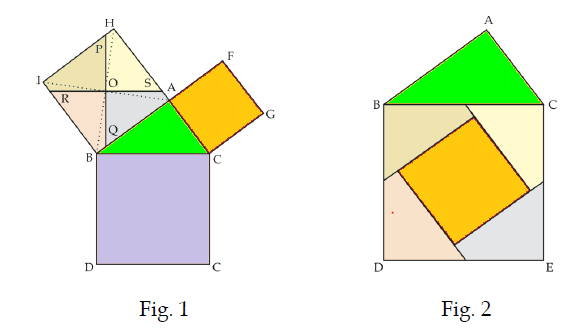 Similarly cut squares of sides b cm and c cm and place them along the respective sides of the right angles triangle. Join BH and AI. These are two diagonals of the square ABIH. The two diagonals intersect each other at the point O. Through O, draw $RS || BC$. Draw PQ, the perpendicular bisector of RS, passing through O. Now the square ABIH is divided in four quadrilaterals. Colour them as shown in figure. From the square ABIH cut the four quadrilaterals. If a perpendicular is drawn from the vertex of the right angle of a right triangle to the hypotenuse, the triangles on each side of the perpendicular are similar to the whole triangle and similar to each other. If in two right triangles, hypotenuse and one side of one triangle are proportional to the hypotenuse and one side of the other triangle, then the two triangles are similar by RHS similarity criterion. Question 1 Sides of two similar triangles are in the ratio 4:9.What is the ratio of areas of these triangles ? Question 2 In a right angle triangle shown below ? Question 4 If in two triangles, the corresponding angles are equal, their corresponding sides. Question 5 If a line divides two sides of a triangle in the same ratio, the line is? Question 6 Check the correct answer ?